There is growing evidence that evolved massive stars pass through a highly unstable state near the end of their brief lives. Eta Carinae is sometimes included with a larger class of these unstable luminous hot stars called Luminous Blue Variables. LBV's exhibit a particular type of instability whose defining characteristic is an irregular eruption or outburst. 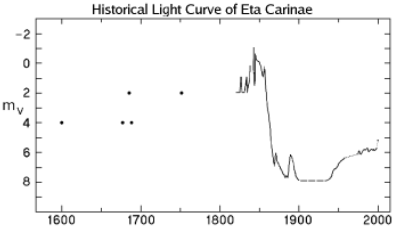 In a "normal" LBV or S Doradus- type eruption, the star brightens by 1 to 2 magnitudes at visual wave- lengths, the event is measured in years, and the star maintains approximately constant bolometric luminosity with corresponding changes in its spectrum and apparent temperature ( Humphreys and Davidson 1994). S Doradus in the LMC and AG Car are excellent examples of a normal or classical LBV eruption. A small subset of this group that we have called "giant eruption" LBVs or "eta Carinae variables" ( Humphreys, Davidson and Smith 1999) experience eruptions during which their total luminosities increase significantly and the star survives. In these eruptions the star may expel several solar masses and its total luminous energy may rival that of a supernova. Eta Car is of course the best-known member of this rare group of stars with its famous great eruption in the 1840's. The recently discovered variable V1 in NGC 2363 ( Drissen, Roy, & Robert 1997, Drissen et al 2001) and the "pistol" star near the Galactic center ( Figer et al. 1998) may also be similar. 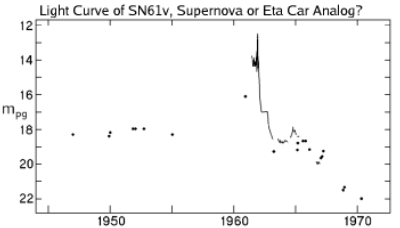 The light curves of SN1961v, SN1954j and P Cyg are shown here together with eta Car for comparison. Note that three of these stars have been called supernovae: SN1961v, eta Car, and SN1954j (V12 in NGC 2403). SN1961v and eta Car were the only two members of Zwicky's Type V ( Zwicky 1965) class of supernovae which he proposed for under luminous supernovae. The recent supernovae surveys have discovered several peculiar objects especially among the Type IIn's that may include eta Car-like giant eruptions and more normal LBV outbursts. SN 1997bs ( van Dyk et al 2000), SN 1999bw ( Filippenko, Li and Modjaz 1999), SN 2000ch ( Wagner et al 2004) and SN2002kg (Van Dyk et al 2004) were not true supernovae. Given the very high luminosities reached during these giant eruptions and because of the close identification of several members of this group with a supernovae designation at various times, a catchier name for them is "supernovae impostors." Confirmation that these are all examples of eta Carinae-like giant eruptions, is the detection of the remnant star. Of course we know that eta Car and P Cygni survived their eruptions and we have recently recovered the image of V12 ( Smith, Humphreys and Gehrz 2001). 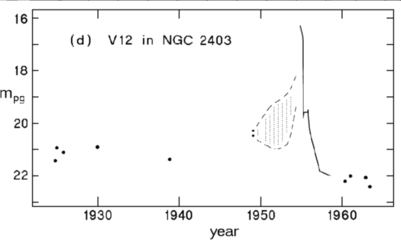 The nature of the SN1961v eruption and the detection of the surviving star is more controversial ( Filippenko et al 1995, van Dyk et al. 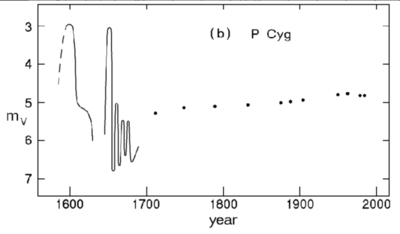 2002, Stockdale et al 2001, Chu et al 2004). The increasing number of objects displaying characteristics similar to eta Car's great eruption suggests that these "giant eruptions" are not so very rare, therefore raising some interesting questions about how the very most massive stars end their lives.